Serum C contains ingredients that are 600 times more potent than vitamin E. Years of cosmetic and pharmaceutical research have yielded the new science of dermaceutics. This cutting edge field combines phytonutrients and other plant-based compounds with modern pharmaceutical technology to enhance bio-availability and effectiveness. Serum C is part of a series of advanced Dermaceutics that works immediately to improve the health and appearance of aging skin with enhanced clarity, texture, and tone. Serum C combines The well-documented effects of 10% L-Ascorbic acid (the most potent form of vitamin C) and complimentary botanicals from Maxogenol with a highly effective dermaceutical delivery system. Unlike existing products that may contain other dosage forms of vitamin C, the 10% L-Ascorbic acid in Serum C appears to work on the inner layers of the skin where the greatest results are seen in repairing damaged skin. The antioxidant effects of Serum Cs ingredients have been proven to neutralize free radical activity caused by exposure to the sun, stress, pollution, and smoking. Serum C works to protect the skin from this damage that takes place every day. As Serum C penetrates deeply into the skin it works to repair damage from the sun, aging and the environment. Skin becomes radiant as lines disappear, color evens, and skin tone takes on a more youthful look and feel. Until now, L-Ascorbic acid has been molecularly unstable in liquids where it quickly loses many of its benefits. The science of Dermaceutics has solved this stability problem with Serum C-the first 10% L-Ascorbic acid to maintain long term stability and ensure optimal results throughout its use. Serum C contains Maxogenol, a powerful botanical complex with over 150 natural ingredients, including grape skins and seeds and Costal White Pine Bark, that help to protect and nurture the skin. Maxogenol works synergistically with L-Ascorbic acid to offer you the most potent topical anti aging skin treatment. 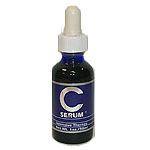 Serum C should be applied 1 to 2 times daily. If your skin is dry, once daily is sufficient. Your face and hands should be cleansed prior to applying Serum C. After Serum C is absorbed, you then should follow with Nutragel. Face, throat and chest, are the most common areas to need Serum C. Although Serum C can be used under eye area, never apply close to lash area, corners of eye, or eye lid. Any area of the body that has been exposed to the sun and is showing signs of premature aging would benefit from Serum C. Serum C may be used with alpha hydroxy acids, glycolic acids, or Retin A. However, unless specified, it is recommended that Serum C be applied at opposite times of the day when using products listed due to their exfoliating qualities. SUN EXPOSURE: Sunblock is highly recommended in order that further premature aging be avoided. Serum C is designed to work on improving existing sun damage, therefore, prevention of further damage is best. The incidents of allergies to Serum C have been insignificant, however as with any product, if your skin shows signs of sensitivity, rinse area with warm water and discontinue use. If symptoms persist a skin care specialist should be advised.